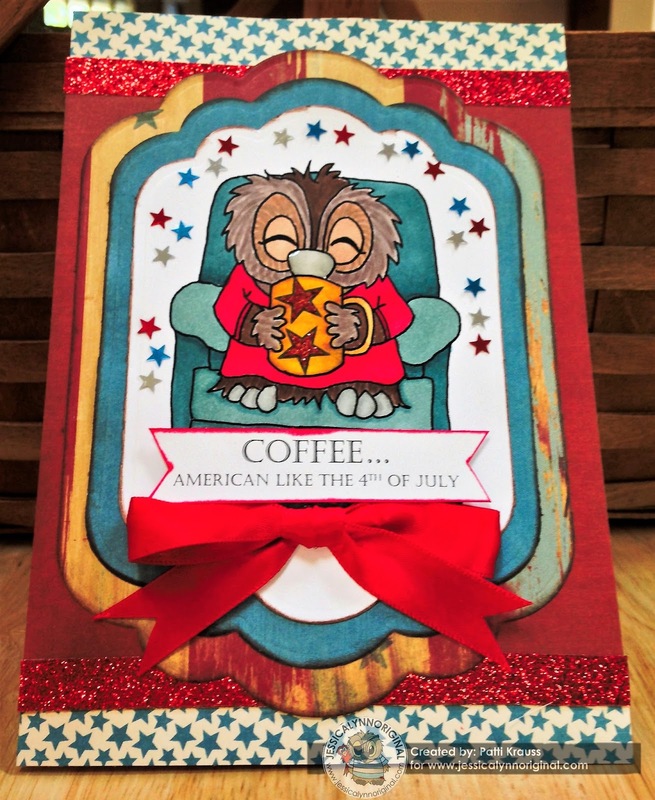 Hi Friends: The Coffee Lovers Blog Hop started Friday and is in full swing with lots of great coffee-themed cards! JessicaLynnOriginal stamps is one of the sponsors for the hop - here's my 2nd card featuring this cute Brentwood Coffee Lovers Summer 2017 digital stamp available for free during the hop. I hope that you are inspired by my card and will join us for this fun blog hop! We would love to see what you do with this set, if you want to post them up on Jessica's Facebook page, too. Print image onto smooth white cardstock and color with Spectrum Noir markers. Cut the focal image with the label die, then add glossy accents to beak. Stamp stars onto the coffee mug, then add red stickles to them. Print, then cut the sentiment into a banner, edge with marker, then add to recliner with foam squares. Add patterned paper to A7 card base, then add red glitter tape at seams. Cut 2 larger label dies from patterned papers, ink edges, layer under focal image and glue to card base. Add red ribbon bow under sentiment. Finish with a sprinkling of red, silver, and blue star sequins around the focal image. What a cute card! Love all the stars and the red glitter paper! Love all the colours and fun elements you used! Great card! Gorgeous layers on this lovely card. Fantastic! Love this red white and blue but a little bit distressed look... fantastic design! Super cute and a great sentiment too!